As you’d expect, Kasparov had a busy schedule on his recent short trip to the Georgian capital, Tbilisi. In his Russian blog he tells us he gave two lectures, “Origins of the Global Crisis” and “Geopolitical Challenges of the 21st Century”, but he also switched from economics to chess to take on 11 of the best young Georgian players in a simultaneous exhibition. 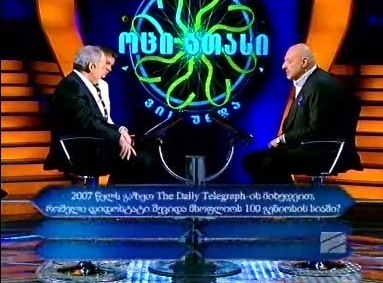 The most remarkable part of the trip, however, was appearing on “Who Wants To Be A Millionaire?”, or as the Georgian charity version broadcast on Rustavi 2 is known, “Who Wants To Get 20,000?”. You can find a video of the full broadcast here (including segments showing the family needing help with expensive medical treatment) – the text on screen is in Georgian, but when the presenter talks to the Kasparovs he uses Russian. Below I’ve translated all 15 (or in fact 16!) questions. That was made much easier by the transcription posted at Chess-News.ru. I’ve also included some comments taken from Kasparov’s blog. So then, time for you to test yourself against the great man! Note: if you hover over the word “answer” after each set of options you should see the correct answer (and yes, some of the questions do have a definite Russian/Georgian slant – no-one said it was going to be fair!). 1. 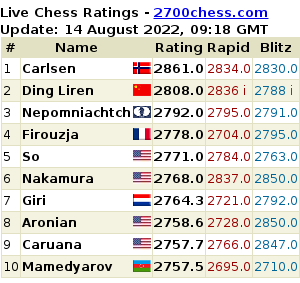 (20 lari) Which chess prize is awarded to the world’s best chess players? 2. (30 lari) How old was Garry Kasparov in 1985 when he became the youngest World Champion in the history of chess? 3. (40 lari) Which grandmaster made it onto the list of the “Top 100 living geniuses”, published by the Daily Telegraph newspaper in 2007? 4. (50 lari) Which traditional Georgian dish is similar to pelmeni? 6. (200 lari) What’s the meaning of the collocation “shakh mat” (checkmate), from which the Russian “shakhmaty” (chess) derives? 7. (400 lari) Which abbreviation in the Latin alphabet is the conventional international representation of the Georgian currency, the “lari”? 8. (800 lari) Which of these twentieth-century events took place before the others? 9. (1600 lari) Leonid Gaidai’s film “Ivan Vasilievich Changes Profession” is based on a work by which writer? The Kasparovs successfully “asked the audience” about the monarchs here. 11. (4000 lari) Onychophagia manifests itself as which nervous tic? 13. (8000 lari) What, according to the prophecy of St. Malachy, will be the name of the last Pope, which is reputed to be one of the reasons the Popes never choose that name? 14. (12000 lari) Which of the following is the last opera of Giuseppe Verdi? The Kasparovs used their 50:50 here. That left TWO OPTIONS (hover over the text to reveal them). 15. (20000 lari) Which of these combinations corresponds to the number 5 in Morse Code? Here the Kasparovs weren’t sure and phoned a friend, to no avail. This charity version of the quiz show has one extra “lifeline”, however – the option to try an alternative question. So they used it! 15. (20000 lari) Which strait was the French pilot and engineer Louis Blériot the first to fly across on 25 July 1909? And sitting in the studio were the children who needed our help – a brother and sister with a heart defect who needed an immediate operation. In such moments you feel an enormous responsibility, and you begin to lose your confidence. I told the presenter that for me the set phrase, “I earn a living” (in Russian: “I earn for life”) had a literal meaning for the first time. The cowardly thought of stopping on a win of 12,000 flashed through my head, but Dasha put a stop to those hesitations. We nevertheless said “xxxxxxxxx” and won 20 thousand lari for that family! Actually, as Kasparov notes, the family received more than that. Phone calls during the show raised an additional 46,200 lari. For the first question on the Chess Oscar, Garry points out that Karpov’s first Oscar from Spain was actually in the shape of a bear. On the geniuses – Kasparov notes one of the other three Russian geniuses included on the list was Kalashnikov! The presenter asks Dasha what it’s like to be the wife of a genius: “A great responsibility”. Dasha reveals that her first encounter with Kasparov is on film, as she interviewed him while she was still a student. 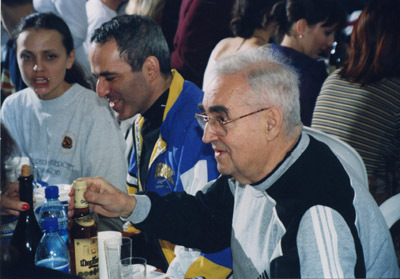 Incidentally, in his notes to the following photo at e3e5.com, the now 85-year-old GM Mark Taimanov revealed that he was the one who invited Kasparov to this event at her university, and on the next occasion Garry and Dasha met. 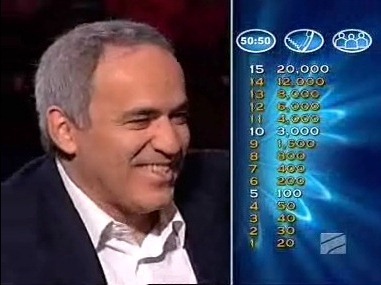 Kasparov initially dismissed Monaco before asking the audience to vote. Even then it was close, as Monaco was only ahead of Belgium by 2%. The question on the European Union sees Kasparov almost drive the presenter crazy by twice trying to count the number of countries (starting from Portugal and heading east!). He does an impressive job of getting to 26 (one short), but decides there can’t be another four so the answer must be 27. The opera question nearly proves fatal. Despite his mother being a great opera fan Kasparov is ready to pick Aida until the 50:50 removes it. Only Shakespeare operas left, as I'm sure you can read! They don’t know any Morse Code other than SOS, and so decide to “phone a friend”. The question is whether to phone Mig Greengard, in New York, or Dennis (I think) in Moscow. Garry says at one point that he’s 100% sure Mig would know. Dasha even starts to rehearse the question in English (“the language of Morse”), but in the end they choose Moscow. It’s something of an anticlimax as the person they phone doesn’t manage to answer before time runs out. Garry: “If only we’d phoned Mig”. Dasha: “Garik, don’t despair!”. The final last question (if that makes sense! ), is strangely simple. Dasha immediately says it must be La Manche, and Garry painstakingly weighs the logic but can’t find the slightest reason for another answer (Dasha had the best quote – she’s only travelled in the tunnel under it and quipped: “the landscape was beautiful”.) They’re puzzled because the question seems too easy for 20,000. Garry unravelled the mystery on his blog: in fact the producers didn’t have a replacement question of equal difficulty ready, as no-one had got that far before (it’s logic, Jim, but not as we know it…). So they had to use an easier question. It almost worked as a clever bluff, but Kasparov followed female intuition and everything ended happily! So the question is, would Mig have known!? I loved this post! I think the program is a fantastic idea, its aim couldn´t be better and it´s great for the audience! I went through the questions and I would have missed the one about Kennedy and Verdi´s opera (although I´m an opera fan myself), apart from the morse one, EEK! I was actually quite surprised to see that Kasparov, who has been trying to make his career in politics take off for the last few years, didn´t know how many countries there are in the EU. Anyway, congratulations to the Kasparovs and best wishes for the brother and sister who needed the operation! Yep, I was surprised Kasparov didn’t know the EU one – you’d think it would have come up in some lecture somewhere, and that he never forgets a fact. Still, it was much more entertaining seeing him trying to work it out :) (I’d have got that one, but only because I got it wrong recently in a “general knowledge” exam for a translating course!). In general, when I saw he’d won the show I assumed it would just be because of his memory, but the noticeable thing is how he goes about reasoning everything out (not that that should really surprise us…). Sometimes it goes to extremes – for the Bulgakov question Dasha immediately said she simply knew the answer & it looked as though Kasparov probably did too, but he insisted on giving a logical proof of why it had to be the right answer. :)) Actually, I forgot the question about “shakh mat” – I really can’t believe Kasparov didn’t simply know the answer to that, but again he went through it logically. Maybe to entertain the audience!? I’m just mildly curious about how Topalov did, so don’t go out of your way to find the answer! (I thought about combining the two in one post, but obviously I won’t now) It was strange, though, that were lots of details about what was said on the show: e.g. http://www.chessintranslation.com/2010/11/bits-and-pieces-1/ But then nothing, as far as I could see, about how it actually went. I’m guessing he didn’t put in a Kasparov-like performance! p.s. a minor linguistic curiosity: Chessbase’s entirely original report on the Kasparov show, which obviously didn’t make any use whatsoever of my post here and had no need to link to it… has question 9 as: “Leonid Gaidai’s film ‘Ivan Vasilievich Changes his Profession’ is based on a novel by which author?” The only problem is it’s based on a play, not a novel. Probably Friedel used the Google translation, which in this context strangely gives “novel” instead of “work” (maybe because Google uses a statistical model and in practical terms the words are often interchangeable). I agree with you on the suspicion that, if Topalov´s results weren´t given, they must have been less astrological hehe. Google translation can be wrong because languages can be ambiguous. Apparently Russian has the same word for “world” and “peace” – so Google may refer to Kasparov, Kramnik, Ponomariov etc. as “champion of peace”. Someone (Mikhail Golubev?) once mentioned a former Soviet joke on a chess forum: “We want peace, and all of it!!”. A German chessic example is that “Zug” can mean ‘move’ or, more commonly, ‘train’. I just made a related joke on Jan Gustafsson’s blog – he wrote that he had taken the wrong train (from Hamburg to Berlin while his destination was Frankfurt), and then he won both of his Bundesliga games last weekend. I am fairly shocked a question on morse code was the ‘hardest’ question there… out of the bunch I found that the easiest to answer. I didn’t even have to pause to read all the options as I knew it off the tip of my tongue. I am even more shocked that Kasparov didn’t know it. http://james-plasketts-coincidence-diary.blogspot.com/2007/12/223-le-sige-perileux.html although New Yorker, Maurice Ashley http://en.wikipedia.org/wiki/Maurice_Ashley made it to the studio stage of the game. I also got help from my wife – she was my Phone A Friend. I had the million in my sights, what with all three lifelines left with three questions to go. But then I cracked up.